Yesterday, Porsche debuted a new 911 GT2 RS Clubsport in a charming black Martini color scheme. I don’t know how many recognize the car or the race it pays tribute to, but both were among the sketchiest I’ve come across. 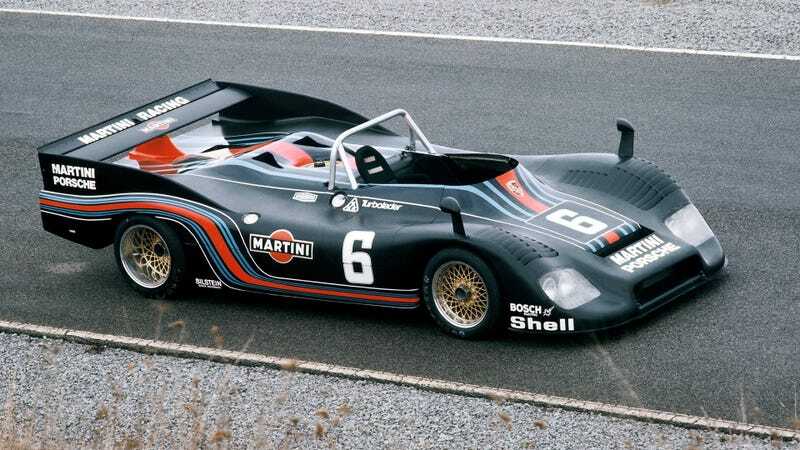 Back in 1976, Porsche debuted its new prototype race car, the 936. Weight was 1,543 pounds. The engine made 520 horsepower. Big turbo, no roof. A sketchy car by specs alone. That’s before you get to how its first race went. The debut itself was at the 300 km sprint race at the Nürburgring that year, running, as you would back then, on the Nordschleife with little in the way of crash barriers. Rolf Stommelen, the quick returning factory driver at the time, was at the wheel. He qualified second for the Porsche works team (then called Porsche System Engineering), the specialist David behind the relative manufacturing Goliath of Renault, Porsche’s big endurance racing rival at that time before Lancia stepped in just before Group C got going. Stommelen führte das Rennen bis zur 6. Runde an, dann mußte er mit einem klemmenden Gaszug zur Box. Sein Gasschieber blieb auf einer 3/4-Offen-Stellung stehen. Normalerweise wäre das Rennen für den 936 beendet gewesen. Angesichts des kurzen Rennens lohnte ein Wechsel des Gaszuges nicht. Also wurde Rolf wieder auf die Strecke geschickt. Er fuhr den Wagen mit dem Hauptstromschalter. Vor den Kurven Strom (und damit auch der Motor) aus, danach Strom wieder ein und Vollgas. Kaum einer mag wirklich beurteilen können, welche gigantische fahrerische Leistung Rolf ablieferte. Stommelen led the race up until the sixth lap, then he had to pit with a stuck throttle cable. ﻿His throttle was holding at 3/4s open. Normally, the race would be over for the 936. But given that it was a short race, it didn’t make sense to swap out the throttle cable. So Rolf got sent back out on track. He drove the car with the main power cutoff switch. Before a corner, cut the power (and the engine along with it), then power back on and full throttle. One can hardly figure what significant, ahem, driving power Rolf was dealing with. Ah, yeah, driving the car on/off with a stuck throttle using the kill switch. Cool. Stommelen finished second, even after all that. Unreal. This isn’t a story you’d come across in any of Porsche’s official history pages, nor could I find any pictures of the car on its site. I emailed Porsche and got these photos from Porsche’s ever-helpful archives, a wild story, if one that the company maybe doesn’t rush to tell. I would say that this is presumably how the car got its nickname of “black widow,” but I don’t know if this race was the only part of it. The 936 won Le Mans that year, but only after the lead 936 broke a connecting rod, and the next 936 blew a head gasket, by which point the third 936 was sitting in 41st place thanks to a bad injection pump that took half an hour to replace, as detailed in Paul Frère’s The Porsche Book. Porsche swapped drivers around and managed to claw back half an hour of time, climbing to the lead, limping the car around so gingerly that it seized a piston running on part throttle. The car finished its last two laps down a cylinder. So when you see the black, red and blue 911 GT2 RS Clubsport, know that it honors a race car that was scarier than most, even in its day.